"Step into the Villa Magnolia Estate where your storybook dreams will come true!This exquisite European-styled custom home on 19.7 acres provides endless opportunities to enjoy the beautiful views of the orchard & snowcapped peaks of Mt. Shasta & Mt. Lassen. They are especially spectacular from the 900 sf Apartment above detached garage/shop.French doors lead to multiple patios to enjoy effervescent sunsets, watch humming birds or wander through your own English rose garden. Custom iron doors add architectural style to the lounge/bar & formal dining room, offering cozy places to entertain.Accents in the dining room include built in Mahogany china cabinets, arched windows & an Italian carved travertine fireplace.The expansive kitchen is a chef s delight & the cornerstone of where memories are made! Stainless Viking gas range, Sub-Zero refrigerator, Corbels, crown moldings & casings, bring a classic flair to this popular meeting place. The comfy family room, features rustic knotty cedar walls, exposed angel wing timbers & a hand crafted granite fireplace for a Renaissance feel. Curl up,read a book, listen to music, draw, the library inspires creativity & romance.Enter the elegant living room with 14 ceilings, a stately white fireplace & natural lighting. Swarovski crystal chandeliers, radiant heat floors, solid Alder doors & slate roof are featured throughout the home.Too many features to list! Must see, including the whimsical private telephone booth! This may be your kismet." "A private ski lake all to yourself on 40 acres just west of Chico. 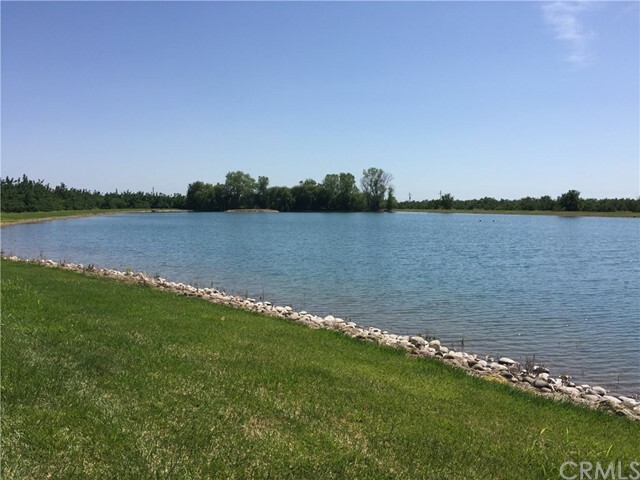 Improvements include a 3 bedroom 2 bath home, a 30' x 70' metal shop, 17 acres of Chandler walnuts planted in 2006 for supplemental cash flow and two docks, one main one with a power lift for the boat and a guest dock. This lake is certified for tournaments by the American Water Ski Association. The well for the orchard and lake has a 60 H.P. electric turbine and the orchard is irrigated by a solid set system. Please click on the virtual tour icon directly under the map in the listing to view drone video of the property." "Luxurious 4 bedroom 2.5 bathroom estate plus office set on a sprawling 3.72 acre lot with unobstructed city, valley and nature views! This home features vaulted ceilings and extensive double pane windows that offer magnificent views and gorgeous sunsets. The upstairs master bedroom has a large walk-in closet, workout room or office as well as an enormous deck with panoramic views and a spiral staircase leading down to the pool/spa. There is also an attached three-car garage. This large estate is situated at the end of a cul-de-sac affording lots of privacy. Enjoy the outdoor grill area, pool, spa, and your very own sports court! Own this one of a kind property in the prestigious Canyon Oaks development with a private golf course and the security of a gated community. Rear of property overlooks Bidwell Golf Course and upper park. Have your own private nature preserve and miles of neighborhood hiking." "Never before on the market, custom built estate, with exquisite craftsmanship, sophisticated elegance, and modern luxury. Step through the handcrafted wood and beveled glass dual front doors, into an extraordinary living experience, designed for comfort, privacy, and serenity. This single story Mediterranean style home is an entertainer s dream, with its open floor plan, spacious living room with 16 ft ceiling, and adjoining gourmet kitchen equipped with; 6 burner range, dual ovens, dual dishwashers, Sub-Zero refrigerator, and built-in wet bar with 60 bottle white wine frig. In addition, there is also a climate controlled red wine closet, that holds approx. 600-700 bottles. The spacious master suite feels like a private retreat, with 16 ft coffered ceilings, cozy fireplace, sitting area, and a glass slider off the patio. The adjoining master bathroom, boasts imported marble tile floor, jetted soaking tub, separate walk in shower, water closet with bidet, double vanities, 2 lg walk in closets, and its own private entrance that leads to the backyard. The stunning grounds are a virtual outdoor paradise, with meandering brick walkways, majestic oak trees, lg koi pond with pergola and cascading water fall, raised garden beds, fruit trees. The information contained herein has been obtained through sources deemed reliable but cannot be guaranteed as to its accuracy. Sq. ft., bed/baths , & lot size taken from public records. Buyer is advised to investigate to their satisfaction." "Absolutely STUNNING Mediterranean style home, located in Canyon Oaks! Exquisite elegance inside,peaceful serenity outside. This home boasts 4 bds, 3.5 bathrooms, sep living room, family room, formal dining room, and a bonus room with a wet bar and a half bath. Enter through the private front courtyard and you will notice the extras throughout the home such as arched doorways, rounded corners, large baseboards, upgraded tile flooring and carpeting, custom lighting and fans, built in cabinets and art nooks with lighting. This home also has an oversized indoor laundry room, power blinds, HVAC, and a whole house fan. The kitchen is designed with upgraded granite counters and backsplash, custom spice rack, deep sliding drawers for pots and pans, and upgraded appliances. The master suite is privately located on one side of the house, and the gorgeous master bath has a sep tub/shower, dual sinks, vanity, and a fantastic walk in closet. Next, take a step outside into this private, remarkable backyard. The back covered patio is your front row seating to watch the sunsets. Walk down the steps and you'll find a beautiful salt water pool, an outdoor kitchen with granite counters, fan, lighting, speakers, and custom rock walls and matching pergola. The oversized side yard can be used as a dog run, and there is extensive storage underneath the house. The 3 car garage has an extra nook for golf cart parking and includes custom cabinets and work bench. This is a MUST SEE!!" 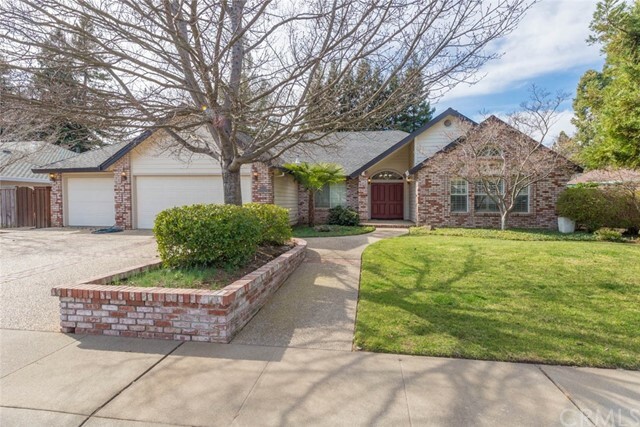 "Wonderful home, Prime North Chico location!!! 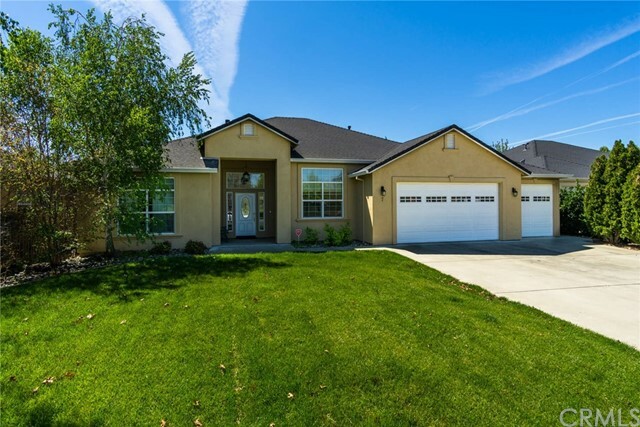 Located in one of Chico s most desirable upscale neighborhoods Pheasant Landing, situated at the end of the cut de sac on approx. 1 acre . Enjoy the wonderful feeling of home, offering an open & bright floor plan w/ 5 bedrooms, 3.5 bath & approx. 3,456 sq. ft. of living space, attached 3 car garage, & a detached shop. 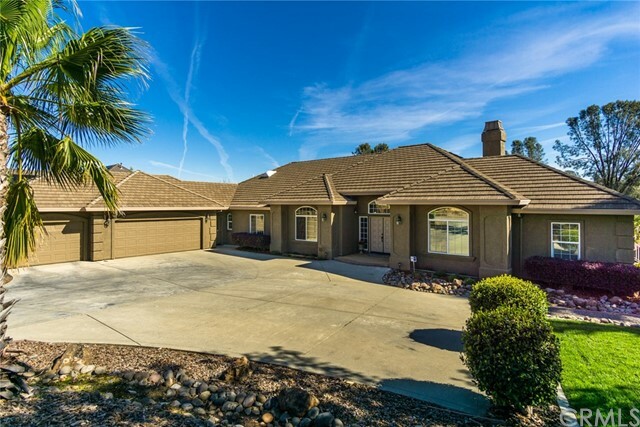 This well laid out floor plan has separate living, family & dining rooms, an eating nook looking out to the backyard & pool area, a large kitchen w/ island, attractive granite counter tops, beautiful cabinetry, stainless steel appliances, double wall ovens, 5 burner gas cook top & walk in pantry, gas fireplace, ceiling fans, crown molding, whole house & attic fans, central vac system & surround sound. Outside, sit back & relax & enjoy the sparkling in ground pool, the large landscaped backyard with low maintenance landscape where you can enjoy all of your outdoor activities, including an area for volleyball, large play structure area, fruit & nut trees, raised garden beds, amazing rose garden area, a nice size covered back patio, RV gate along w/ RV parking. We are pleased to present you this wonderful home! The information contained herein has been obtained through sources deemed reliable but cannot be guaranteed as to its accuracy. Sq. ft. & lot size taken from public records County records show 4 bed. 4 baths -agent notes 5 bed. 3.50 baths. Buyer is advised to investigate to their satisfaction." "Exceptional Location! 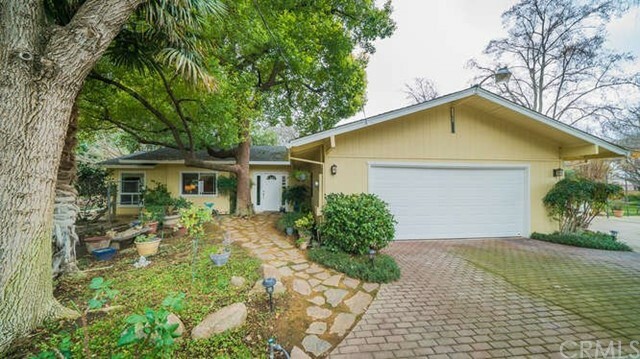 - Horse Property/Close to Bidwell Park! 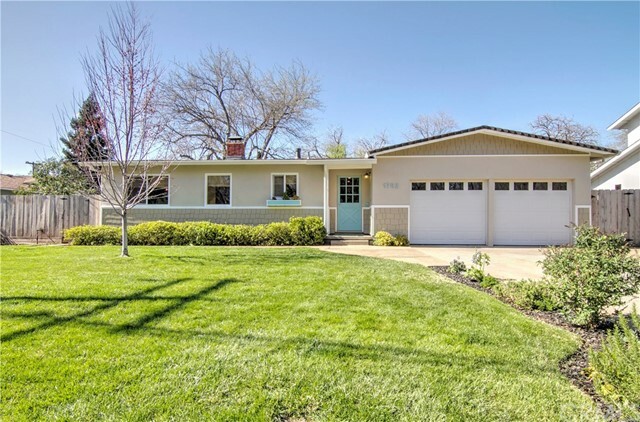 Don t miss out on a rare opportunity to live near Bidwell Park! Whether you are looking for horse property or a little space, this opportunity doesn t come along every day This 1963 ranch style home offers 3 bedrooms, 2 baths w/ approx. 1928 sq. ft. of living space. Featuring an open floor plan, with master bed and bath on the opposite side of the home, large family room, a nicely updated kitchen with island/eating bar, attractive granite counter tops with granite backsplash, stainless/black appliances, double oven with convection bake and large 5 burner gas cook top. Off the kitchen is a large rock fireplace with wood stove insert for those cozy winter nights, a large dining area and large pantry/room off kitchen. Beautiful engineered hardwood flooring throughout the family room and hallway, enclosed front porch/mud room, separate laundry room, covered back patio and attached 2 car garage. Property has the potential to be split, per Butte County Planning Dept. Buyer to investigate to their satisfaction. The information contained herein has been obtained through sources deemed reliable but cannot be guaranteed as to its accuracy. Sq. ft., bed/baths , & lot size taken from public records. Buyer is advised to investigate to their satisfaction." "ABSOLUTELY BREATH TAKING! The moment you enter the home, you will note the incredible floor plan of an octagon nature, allowing fabulous focal points at every turn! The ceiling design, with up-lighting and soffit work, creates a wonder ambiance to the home. Rich accents of mahogany wood finish throughout, including pillars, cabinetry, built-ins and crown molding, express nothing but elegance throughout the home. The beautiful kitchen, with granite counter top, breakfast nook and walk-in pantry overlook the huge great room and separate formal dining room. The extra-large master suite is a home in itself! It centers on a brick fireplace, an additional sitting area, built-in entertainment cabinet and two master closets. The home has a gorgeous office of built-in mahogany shelving which sets just off of the huge media room with projection style viewing. With minimal changes the media room can easily be the 5th and 6th bedroom. Whether you feel like quietly enjoying your home or you feel like entertaining, this home is perfect for both occasions! 4 bedrooms, 3 baths, 4111 sq. ft. on .31 acre. with in-ground pool. Large 2 car garage with a tandem section. Prime location in a desirable North Chico neighborhood. See it and you will say I want it!" 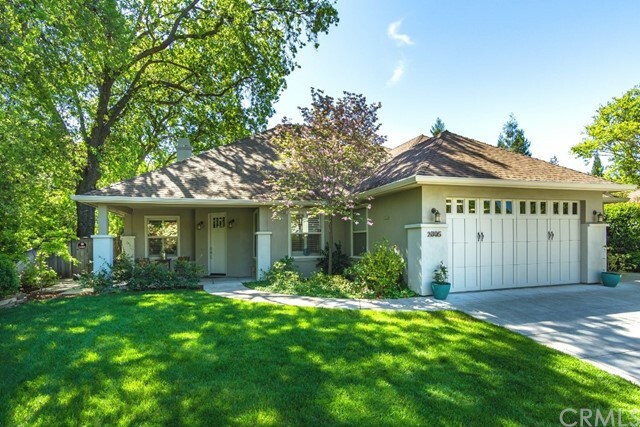 "Beautiful home in prime location walking distance to downtown Chico and Chico State University. The home has 9 bedrooms and 5 baths, and it is currently rented to college students for $6,000 per month. 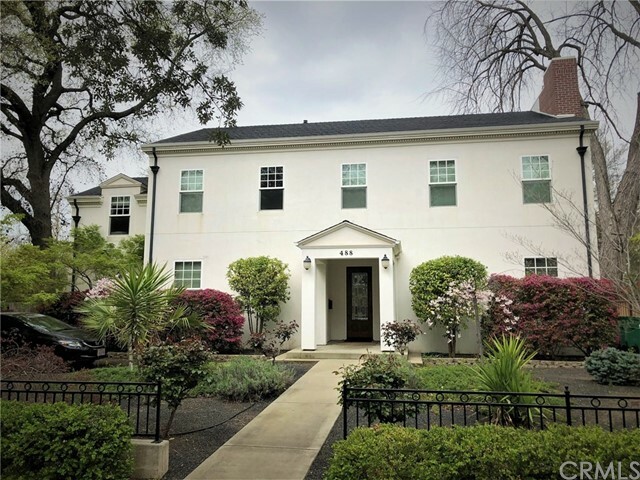 The current lease ends May 31, 2019, and a group of students has submitted applications to rent the home for $6,500 beginning June 1, 2019. For now, the home is available for occupancy on 6/1/19. Originally built in 1950 by the Enloe Family, the home was completely remodeled in 2008 with new electrical, plumbing, appliances, HVAC, roof, windows, light and plumbing fixtures, and new insulation in the walls and attic. Much of the original wood and tile flooring were preserved. The large kitchen features tons of cabinetry, granite counter tops, two sinks, two stoves, two microwaves and two refrigerators. The home also has a finished basement and two sets of washer and drier. All appliances are included with the sale of the home. For income and expense figures, please see Residential Income listing #SN19071512." 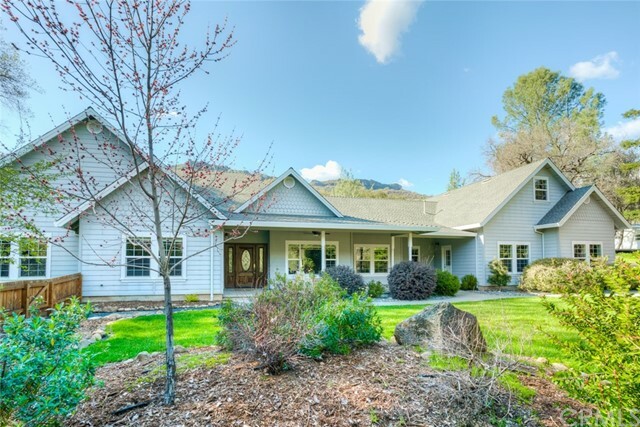 "So much to LOVE about this classy home on 1 acre in the gated Canyon Oaks golf course community! Located at the end of a culdesac with gorgeous views, this is one of the most serene settings you will find. Enter the spacious greatroom with gas log fireplace, built-in shelving and expansive views of the golf course greenbelt. The gourmet kitchen features new stainless appliances, with oversized French door refrigerator/freezer and 6-burner gas range (commercial style dual-fuel convection). Large chef's island, granite countertops, plentiful cherry wood cabinets, and walk-in pantry create a kitchen everyone will want to gather around! The open design features split floor plan, vaulted ceilings, four skylights and lots of large windows inviting natural lighting. Master bedroom exudes ambiance, with gas fireplace, remote window shades and oversized walk-in closet with built-in dressing table/drawers. Don't miss the Roman tub and double shower in master bath! The back bedroom has a walk-in closet and private slider leading to the deck. 4th bedroom is perfect for an office. Roomy laundry/utility room with new gas washer and dryer (included in sale). Imagine the festive gatherings around the inground swimming pool with waterfall! The landscaping is lush and gorgeous, and there is a fenced dog run and large walk-in storage area under house. All this plus a 3-car garage and spacious driveway for parking additional vehicles. You'll want to see this lovely home in a private setting!" "Unbelievable property with spectacular views of the valley and Sierra Nevada Mountain Range. This property is at the end of the road and backs up to Rock Creek. This 2 bedroom / 2.5 bath home features a split floor plan with an upstairs loft for a game room, or an additional bedroom. The kitchen is open to the living room and has a butler s pantry. The back patio is great for hosting and looks over the pool area. Walking out back there is a HUGE 65 x 50 foot shop that can fit all your toys and projects. Just in case that s not enough room, there are two overhangs that are roughly 60 x 20 feet and 50 x 18 feet. This property is very low maintenance and has solar on the roof of the shop. The information contained herein has been obtained through sources deemed reliable but cannot be guaranteed as to its accuracy. Sq. ft., bed/baths , & lot size taken from public records. Buyer is advised to investigate to their satisfaction." "Beautiful , custom-designed , Len Goldman , Architect ---fully furnished home in a park like setting . This is a three bedroom and three bathroom home with a office and additional bedroom / studio upstairs .All furniture , kitchen appliances , bedding , dishes , all pots / pans --bake ware , are included in this truly turn key residence . Exceptional built-in cabinets in all the bedrooms , office ,kitchen and living room . Small kitchen appliances include a seven quart Kitchen Aid Mixer , a Vitamix Blender , Kitchen Aid Food Chopper , cooking utensils and casserole / serving dishes , the home sets on almost a acre of mature landscape that include fruit trees , blueberries , thorn - less blackberries , and six above ground garden boxes . In the garden shed are all the garden tools , John Deere riding lawn mower , with spray attachments and wood chipper .A garden wagon ,wheel barrels and a paint sprayer are included .. The patio includes a 625 sq. ft. pergola that has been plumed for a outdoor kitchen. On top of the pergola are 28 Solar Panels that provide energy for the house . Around the pergola is a professional grade misting system . Make a appointment to see this home it is stunning !!!!" 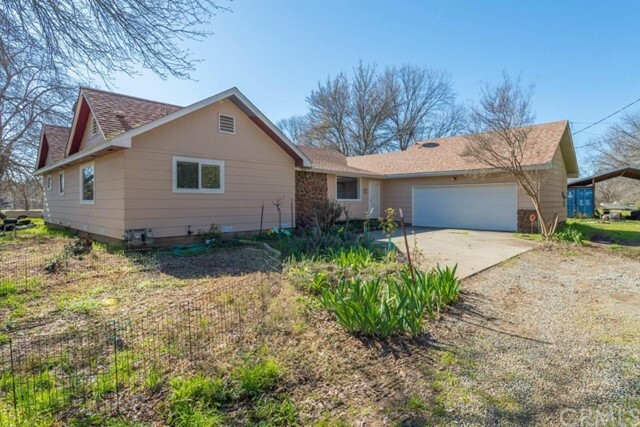 "Unique property on a huge lot in north Chico! Perfect for multiple families or great as an income producing investment property, including 3 structures with a total of 4 units and 2 garages. Directly off Lassen sits the well maintained duplex with 2 bedroom, 1 bath units on each side. The street unit includes a 1 car garage, spacious family room and fireplace. Both duplex units have tasteful updates, fully fenced yards, separate meters, separate laundry and all appliances included. A private gate separates the duplex from the rest of the property, which also includes 2 additional homes, detached 3 car garage with a new roof, fruit producing trees and storage shed. 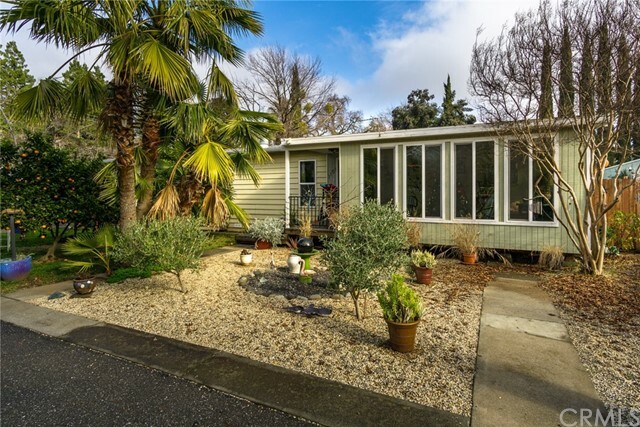 The first home is a special 1900+ sqft triple wide mobile that was lovingly renovated with much of the original 60's flare preserved including a very swanky bar. Other renovations include a bright and cheery sun room, working well on the property, many newer dual pane windows, new HVAC and new flooring throughout. Also included on the property is a bright and open concept 3 bedroom 2 bath 2007 mobile home with vaulted ceilings, breakfast bar, extra large master bath tub, plenty of parking and privacy. There are so many options for what you can do with this income producing property on almost an acre. Conveniently located close to schools and shopping you won't want to miss this one!" "This is the one you ve been waiting for! 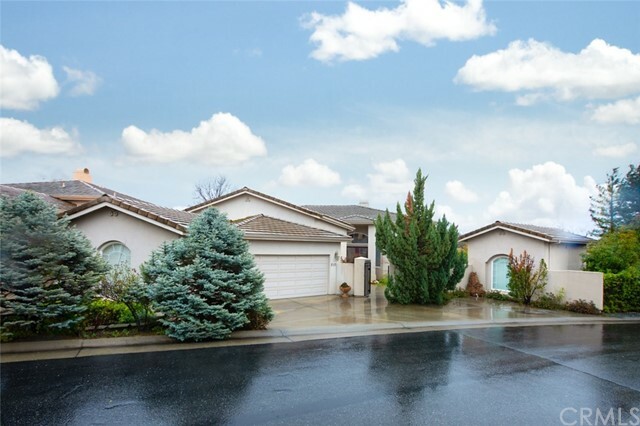 Located in one of Chico s most sought-after neighborhoods. This move in ready home features an entertainer s kitchen, designer backyard, three car garage, 100% owned solar, master bedroom suite and more. The updated kitchen overlooks the living room, the backyard and features an expansive island with step up serving bar plus Pottery Barn pendant lights hanging above; perfect space for hors d oeuvres. Finished with painted soft close cabinets, granite counters, tucked in wine fridge with bar area, upgraded GE profile stainless steel appliances, Kenmore fridge with photo feature, (fun for the family) and a spacious breakfast nook. Cool off during the summer in the designer backyard with custom pool and rock waterfall. The outdoor space, remodeled 2017, is set up for hosting with its in ground hot tub, outdoor gas fire pit and entertainer s island. Island equipped with built in BBQ with gas line, mini fridge, granite counters. Patio is finished with decorative pavers, built-in shade sail, bistro lighting and artificial turf. The master suite boasts single fixed panel French door to the pool area, huge walk in, soaking tub, separate shower and dual sinks. Noteworthy qualities: Nest, gutter guards, gas fireplace, speaker system, whole house vac, water softener, security system, 8 ft doors, 10 ft ceilings, tray ceilings, separate family room, plantation shutters. Don t miss this one of a kind opportunity!" 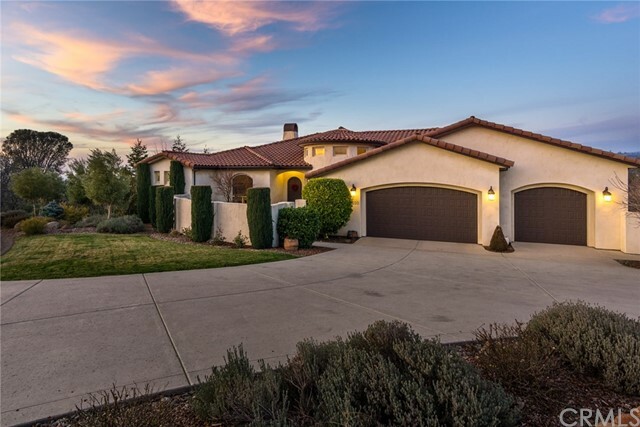 "Absolutely stunning Mediterranean home located in Canyon Oaks gated community in Chico. Enter through gate into a private courtyard. Enjoy watching the sunsets from the covered patio or the pool area. Home located on a large lot, that is landscaped and has lots of privacy. This home features 15 ceilings, family room, living room, dining room. Lots of natural light coming through the huge window. Kitchen features double oven, electric stove top (also plumed with gas). Master suite is spacious with painted murals, large walk-in closet. All bedrooms come with their own bathrooms. Enjoy covered patio with view of the golf course. Main home is 2542 sq. ft. with 800 sq. ft. guest house. Over-sized garage with a golf cart entrance also. This home would be great for entertaining family and friends. Very well-maintained home. Call today for a private showing"
"PRIVATE COUNTRY SETTING in desired Chico area off Bell Rd! This beautiful home has something for everyone!! You will love the floor plan! This home is wonderful for those who like a little space in their living areas! And, it is a great home for entertaining! The large centralized kitchen w/tons of storage, commands the stage! One side of the home unfolds onto the huge semi-formal living/dining room with an open beam ceiling, while the other side of the home lends to the casual side of living. The great master suite, with bamboo flooring, supports a nice master bath and three walk-in closets.The home is located on 1.54 acres! Love gardening? This beautiful home is surrounded by lush flowering landscaping, large shade trees, garden beds and many fruit trees. Splish Splash! The in-ground pool is a perfect way to beat the warm summer heat! Got toys? Enjoy the 1500 sq. ft. barn/shop with 2 roll up doors. Like low monthly energy bills? Then you will appreciate the Solar System! What are you waiting for? Let s take a look!" "Where to start, this property has so much to offer! 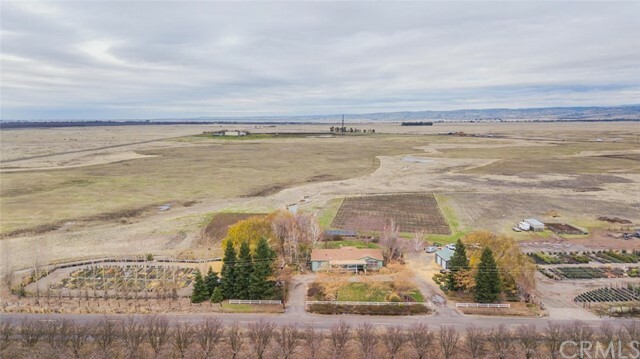 From it s 40 acre parcel that includes a 1.3 acre vineyard, seasonal creek, beautiful mature landscaping, OWNED SOLAR, bordered by orchards, to it s oversized, 2500+ sqft modular home just 15 minutes from downtown Chico. This property has it all!!! The home features new laminate and tile flooring throughout, central heating and air, ceiling fans in every bedroom and living rooms, as well as newer interior and exterior paint. With its 4 bedrooms and 2 bathrooms, this home also has 2 separate living spaces, a fireplace, laundry room, and a huge kitchen with plenty of space with its walk-in pantry for all your storage needs. Enjoy an afternoon or early evening out on the back patio as you take in the mountain sites of Lassen, Shasta and the Trinity Alps with the 180-degree views. Peace and serenity from the privacy of the property surrounds you as you explore the acreage; whether you re gathering eggs from the chicken coop, taking a stroll through the wheat fields, harvesting plants from the 2300sqft greenhouse, or just sitting out front on the Heart Redwood deck, you are sure to feel relaxed and at home. BONUS: Man Shack or a She Shed , the 720sqft shop fixed to a concrete slab is ready for some new toys, whatever they may be! This is a unique find!!!" "Fantastic home located in the heart of Chico. 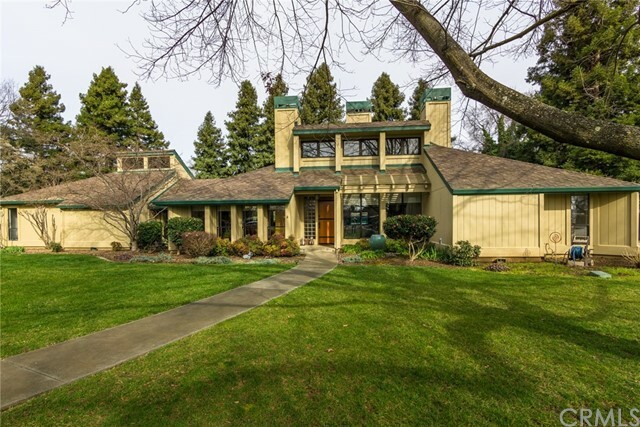 You will love this incredible, exclusive neighborhood just steps away from Bidwell Park. This home has been updated with elegant touches throughout! Wonderful open floor plan with tons of natural light. This home features a spacious living room, dining area and separate family room with a gas fireplace and white brick surround. Stunning, modern kitchen with beautiful quartz counter tops, custom Dovetail white cabinets, wine fridge, stainless steel appliances, double oven, professional five burner gas stove, range hood, built in warming drawer, apron sink and kitchen island with bar top seating. This is an entertainers dream kitchen! On one side of the home you will find a bonus room/office or 4th bedroom and guest bathroom. The other side of the home features two guest bedrooms and your master suite. This master suite has it all! Private access to a covered patio, walk in closet and second closet, gorgeous updated in-suite with quartz counters, dual sinks and a floor to ceiling tiled shower. This home also features newer windows, hardwood floors in the common areas, tile in the bathrooms, recessed lighting, large laundry room, newer roof and SOLAR! The private backyard has low maintenance/low water landscaping and plenty of room for a pool!" "Own Butte Creek water front property! This oasis is only 12 miles from town. Turn key, immaculate 4 bedrooms 3 full bathrooms. Master suite has a fireplace, jetted tub, high ceilings and a walk in closet. One of the bedroom is on the opposite side of the house with outside entry. Kitchen is open to the family room for entertaining and has an eat in dinning space as well as formal dinning space. There is an office off the entry, plus a large bonus room above garage. The three car garage has a hobby room and a separate shop. Front and back porches are covered for use around the year to enjoy the scenery. 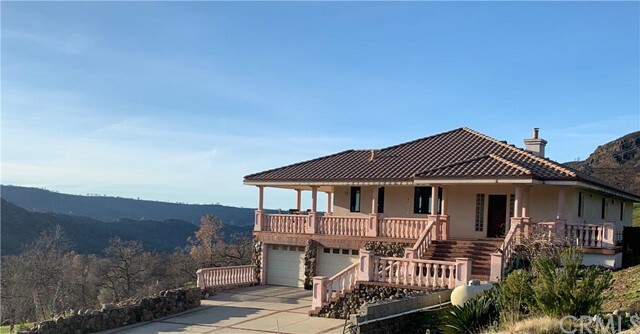 There is automatic gate, fire hydrant with two 300 gallon holding tanks, canyon views from every window....You'll get the best of both worlds with Creek front property and beautiful views. House on west side of Centerville road with property extending to the Creek side for swimming, sunning, kayaking and gold panning. Watch the moon rise over the canyon, see every star in the sky and go to sleep to the sounds of the creek." "Chico living at its finest! 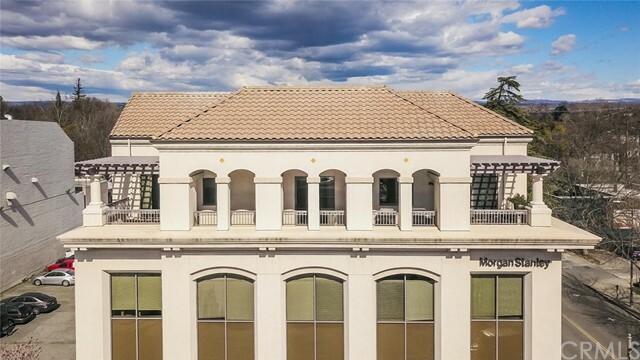 Stunning luxury condo with incredible Downtown Chico views. 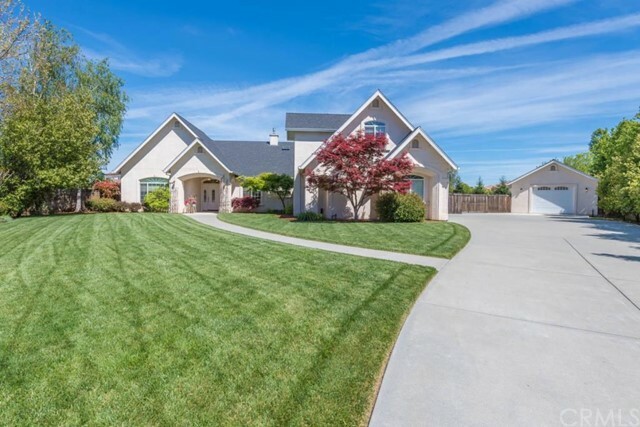 Take your own private elevator that opens up to your foyer and one of the most impressive homes in Chico. Slate floors throughout, spacious open living room with built in cabinets, wet bar with b/i dishwasher & wine refrigerator. Dining area with a 2-sided fireplace and large windows that lead to your first balcony. Check out those views! Gourmet kitchen offers granite counter tops, stainless appliances, bar top seating and large pantry. Huge master suite with a fireplace, en-suite master bathroom with soaking tub, separate shower and enormous walk-in closet! Guest bedroom has access to a separate balcony with great views. This amazing home also features an office with built-in desk and working space, wired as a smart house, w/surround sound & speakers throughout home & deck areas. Garage parking with storage in the building. Enjoy the convenience of Downtown restaurants and shopping right outside your door. Call for a private showing." "This stunning home exemplifies quality craftsmanship. Beautiful panoramic views, wrap around covered Italian tiled porch, and windows everywhere, offering endless natural light. The home has a Mediterranean feel with its tiled roof, brick and concrete stairs leading to the front door. The kitchen is open and airy with a butcher block island for cooking and entertaining, a built in gas range stove, and a lovely dining area. The living room is spacious and open with gorgeous views captured by the floor to ceiling windows. The master bedroom features breathtaking views from the moment you wake up to double glass doors leading out to the wrap around patio. Additionally you will find travertine stone floors, a copper sink, a walk in travertine stone shower. There is a 2 car garage below and a fully enclosed unfinished basement with a finished bathroom. There is a backup generator. Pole barn and huge pond makes horses or cattle possible!" "What's better than being close to Bidwell Park? 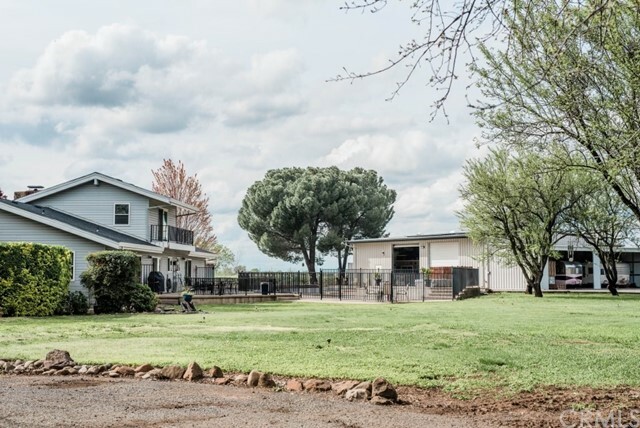 Being near Bidwell Park AND across the street from your own 3+ acre lawn-scape park, all lawn & trees, basketball courts and children's play structures. Then there's the back yard with an amazing swimming pool, water feature and low maintenance, sunny, southside exposure with leased solar. Does this say Executive Home to you? 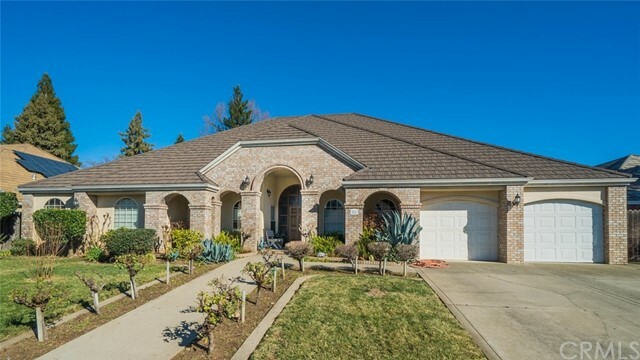 Fine Husa Ranch neighborhood, striking curb appeal, spacious and grand architectural design, and all the big details: high ceilings, crown molding, large format tile floors, formal dining room, built-in cabinets at the entry, granite kitchen counters, big pantry, plus more to see. This versatile floor plan has the open living space, kitchen counter seating plus a good-size breakfast area with a view of the pool. The bedrooms are split 50-50, the master is on it's own with a bathroom featuring double shower, whirlpool spa tub and a pair of sinks, also an organized walk in closet. Plush loop carpets have recently been installed in all the bedrooms and halls. Fourth bedroom not pictured. Laundry room is complete with counters and cabinets and a utility sink. The third bay of the three-car garage has a rear door for convenient access to the back yard. The garage work bench, cabinets and wall storage system are all custom. Park the cars or be in the cave this garage does it for you. Enjoy the enclosed, floor to ceiling windowed sun room with entry from both the kitchen area and master bedroom." "Home was featured on HGTV!!! Located directly across from Bidwell Park in Sierra View school district this home is all about the design & the location! Not a drive by home. Huge open floor plan inside perfect for entertaining lots of guest. 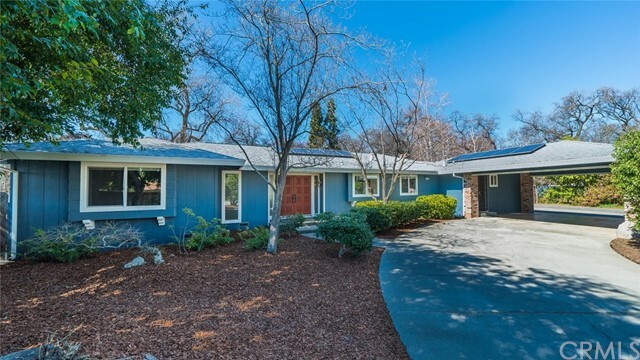 This home has been completely remodeled and professionally designed to bring back the charm of its 1960's era with all the modern amenities of today. Handmade tile back splash & quartz counter tops in kitchen. Original refinished hardwood floors through out living room, formal dining, & bedrooms. Stained concrete hexagon tiled floors in den with large built in wall unit & built in corner nook seating bench with storage. Spacious master bedroom plus 2 additional large guest bedrooms. Both baths are totally updated with white subway tile & new fixtures. Home has tons of storage throughout. Plus!!! New heated saltwater pool with sitting bench & spa with phone app to remotely turn on heat, lights, & waterfalls (Finished July of 2018). Super high efficient modern pool heating system (spa heats in approx 25 min, pool in approx 3-4 hours) Large backyard with lots of shade in Summer & garden area on side yard. Roof is only approx 2 years old. The property is made for entertaining & is move in ready for it's next owner! Only 2 owners have lived in this home since it was built!!"